What’s the most important shot in ALL of golf? You may be surprised to learn that it’s not possessing the ability to bomb it long and straight off the tee. It’s not being able to rescue yourself from trouble out of some pretty nasty rough, or even a really deep bunker. And it isn’t that 10-foot par putt, either. Nope, it’s a shot that would seem to be routine and easy to do. But for many golfers, it isn’t. In this edition of Clampett’s Corner, Bobby explains why mastering a 40-yard pitch shot will turn you into a fantastic ball striker and elevate your game as a whole. 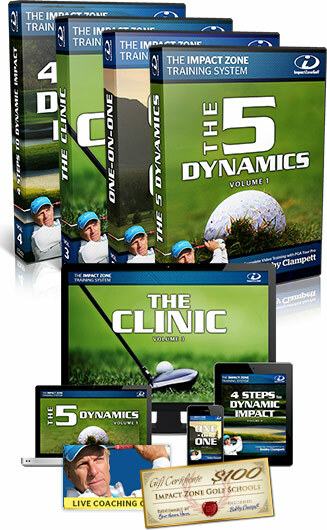 Learning how to correctly utilize all the dynamics of Impact on a 40-yard pitch shot will aid you in delivering many more good shots from any distance throughout your round. Love how simple you make things. My swing is not perfect but by concentrating on impact, I am scoring better and having much more fun. Thanks for that Bobby, I have been playing golf for 50 years (I had to take off my shoes to count that high!) and searching for a swing method that was simple and would produce great results. I feel I am on the right track with your help and info. Love this 40 yard shot. Bobby ! Finally , someone addresses the impact position more seriously. I want to learn more, because I do feel that is the key to raising the level. I’m a lower handicap player mid 50″s now and have always put sooo much concentration on hitting the little ball before the big ball . According to you that is not the concept!! Please if you have a little secret about letting the ball get in the way , do let me know the answer. And the four incher !! Thanks , Kevin ..
Keep the clarity and simplicity coming! Thanks for sharing your magic with those seeking improvement and mastery. Excited to have this great program in my backyard. Loved my 90 min assessment. The guys are both fun and knowledgeable! Can’t wait to go back. Do you always use the same club for this shot (pitching, gap, sand wedge)? This is an excellent lesson! I actually went and did this yesterday for about 40 minutes of hitting just 40 yard pitch shots, concentrating on the 5 dynamics. Then later in the day I played my best league round of golf ever! Pretty amazing. And I will continue doing this often. Somewhere I’ve missed the 4 inch rule. Are you looking 4 inches in front of the ball prior to starting you swing and is that the aim point where you want the club to bottom out? Two days ago I had an epiphany that has changed my ball striking! Simple, “look at a spot 4 in front of the ball” you said. Two or three swings and it radically improved my ball striking consistency! My practice sessions, yesterday I spent 6 hours hitting 40-50 yd pitch shots, are incredible! I had two members observe me at our short shot practice green. They left after short instruction from me excited and greatly improved. My pro came out and was hitting 20-30 yd pitches. He turned and asked me, “How is it I can hit a 220 two iron and can’t hit this shot!” Well, why not share? I told him, “We are all so ball conscience why not try looking at a spot 4 inches in front of the ball.” He took a swing made perfect contact and turned and looked at me with eyes as big as a dinner plate. I left him speechless hitting perfect contact shots and a big smile on his face. Yes, I gave you credit but it was hard not to pretend to be a “golf Buddha”!😜 I went back later and have developed a drill. Real complicated, two blue chalk lines I make with a common tool. I measure exactly 4 inches and make sure they are parallel. One ball on the back line and my focus on the other that is 4 inches in front. Complicated, huh. I am 65 and severely permanently handicapped since 1994 car accident. I have been involved in golf for 60 of those years, grew up in the caddy yard at local country club. This is the single most effective “tip” I have ever read or been told. How have I not heard this before! If I was a teenager my “golf career” would have been greatly improved. Want to discuss “The Golf Machine”? Yeah, I tried that too. A simple thank you is the purpose of this comment. Bobby, I’m now 73 and still play good golf. Don’t hit it as far, and play from the Senior Tees. I’ve shot a few 68s and a bunch of 70 to 79s I’ve won 10 tournaments from 1988 through 2005. I still want to get better. I workout 3 days a week for 2 hours and am very strong. I just want to make better impact with the ball.